Winter has arrived. The hills have their snowy hats on. And an afternoon’s walk in the hills becomes a whole different ballgame. A period of cold, clear and settled weather has meant that the first few days of December have provided perfect winter walking conditions. More snow fell on the hills just a couple of nights ago, providing a powdery white topping on a frozen base. Getting out in the hills again in such magnificent conditions is uplifting: a fantastically white hillside against a deep blue sky; light fluffy snow that makes galloping downhill a joy; the deadening silence of the snow; the crisp, sharp air. But there are frequent reminders of the discomforts and potential dangers that exist: black ice under a seemingly inocuous powdery blanket; the seering wind chill on bare cheeks; blinding spindrift whipped up by a gust; aching fingers slowly warming after being hastily exposed to the elements. I headed north to Killin, an attractive town at the western end of Loch Tay at the confluence of the rivers Dochart and Lochay. There, you’ll find a sturdy, multi-arched bridge just beside the Falls of Dochart, with the snowy Tarmachan ridge of mountains punctuating the skyline. I’d climbed all of the munros around here in Summertime but not in Winter, and hadn’t banked on having to change my plans. 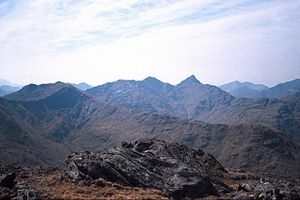 My original plan was to climb the Tarmachan Horseshoe, a short walk from Lochan na Lairige south to the Tarmachan ridge, up over Meall nan Tarmachan (the munro at 1044m or 3,422ft) and back to the lochan via its northern ridge. However, I soon found the steep, single-track access road to the Ben Lawers National Reserve impassable. My van tyres lost traction a few times until I reached a line of parked cars beyond which the road was simply covered in sheet ice (freezing rain on cold tarmac). So instead I opted for an up-and-down ascent of Meall nan Tarmachan via the well-constructed path from the car park – adding an extra 30 minutes’ walk from my parking place further down the hill and taking extra care not to actually step on the hazardously icy road. (Unbelievably, a dozen cars did press on up the road, spinning their wheels to keep moving …). I made good time. Up on the ridge, there was a stunning view of Meall Corranaich (left) and Meall Garbh / Ben Lawers (right), standing out above the snow line to the northeast. Looking southeast, the snow emphasised the knobbly character of the Tarmachan ridge. Beyond this point my camera stayed firmly in its case. Or more precisely, my hands stayed firmly in their gloves for the wind whipped up a severe wind chill. It was hard work picking my way up through the snow, following others’ tracks and taking care not to slip on the ice beneath. I stopped for lunch at the bottom of the last steep incline, sheltering from the gusts blowing spindrift high up into the air. But my hands were numb with the cold even after ten minutes, taking much longer to warm up (and enduring the aching pain you get when the blood slowly returns to the extremities). I didn’t hang about on the summit. It was very cold and blowing a gale. Ominously dark clouds loomed to the north and south. This photo really shows the character of the day. You can see the spindrift whipped up by the strong wind, looking south over Loch Tay in the shadow of a dark cloud. But further down off the ridge and out of the wind, the atmosphere changed markedly. Here, it was simply a crisp winter’s day again. I returned to the van, hoping to take advantage of the light on the drive home now that the sun was becoming low in the sky. Sure enough, the clouds began to turn salmon-pink once I’d driven past Killin, Lochearnhead and down towards Strathyre. I parked the van beside Loch Lubnaig and brewed up a cup of tea (the flexibility of a camper van! ), watching the last of the sunlight disappear behind Ben Ledi. A calm scene after the harshness that Winter can throw at you. In my previous post charting the history of VW camper vans I described how the T1 Splitscreen camper van was born from humble beginnings but rapidly found a market among campers the world over. During the period 1950-67 Westfalia alone produced 25,000 camper vans with Devon, Danbury, Sun-Dial and others producing their own versions. A new model – the T2 with its distinctive Bay window – was launched by VW in 1967 and popularity soared. … or a troupe of nine Brazilian weightlifters. Still, VW didn’t manufacture their own camper vans but allowed other companies to do this, notably Westfalia. Their German range, developed from 1969 through to 1979 was named after European capitals including Paris, Helsinki, Berlin and Madrid. In the UK they were sold as the Caravanette and Continental and the US, the Campmobile. The early Bay campers had wedge roofs that hinged at the front and after 1974, rear-hinging roofs were introduced. Other developments included heating (as an option), swivel seats (after 1976), a 3-way fridge and fully-automatic transmission (1973). Much has been written about the culture that surrounds VW camper vans. The personality and cult of the van grew during this period, being closely associated with hippy and surf culture as well allowing people the world over to enjoy the freedom of the road. The trailer to the Bus Move does a great job in evoking the spirit of the camper van during the 1960s and 1970s. From 1979 onwards VW produced the third generation van, the T3 (also called the T25 in the UK and Vanagon in the US). The T3 was much larger and heavier, with a much squarer shape. An air-cooled version was initially manufactured, subsequently replaced by a water-cooled engine. Besides being made in Germany for European and US markets, the T3 was also produced in South Africa, where the Microbus was marketed on its people-carrying abilities – popularly known as the Volksie Bus. In the US, the introduction of the T3 “Vanagon” was traded on the familiarity and flexibility of previous VW vans – but this time, it was more powerful, had even more space and looked more modern. As a people carrier, it also provided much more space than the emerging competitor, the minivan, as these two commercials from 1984 and 1985 show. Westfalia continued to produce camper vans based on the T3 van featuring a fridge, two-burner stove, stainless steel sink and on-board water tank. Over the years 1979-90 (and beyond of course), the T3 also developed a strong following, as this short excerpt from the Bus Movie shows. The introduction of the T4 model in 1990, being manufactured through to 2003, saw the engine moving to the front of the vehicle. It was a compact van which was marketed on the basis of its people-carrying abilities, with a touch of European sophistication and style, as this US 1993 commericial for the “Eurovan” shows. In Part 3 of the series I will conclude by bring the VW camper van story right up to date with the introduction of the VW California in 2005, the Beach a few years later and then speculation on the next generation, centred around the “Bulli” concept car. The VW camper van is one of the most iconic vehicles ever produced. Few other vehicles have the ability to turn heads and conjure a spirit of freedom, adventure and open roads. This is the first of a three-part series providing you with a potted history of the VW camper van, told both in text but particularly through the imagery created by VW’s own advertising over the decades. VW’s “Think Small” campaign for the Beetle in the 1950s was ranked the best advertising campaign of the twentieth century by Ad Age in a survey of North American advertisements. VW’s campaigns were skillfully designed to build a lifetime of brand loyalty. 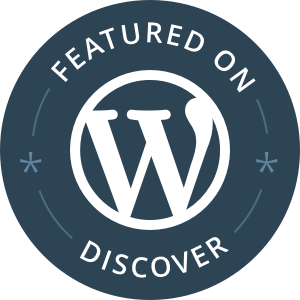 To understand the history of the VW camper van you first need to appreciate how its heritage is directly linked the VW Transporter, the base van also known as the Panel Van, Microbus and Plattenwagen. Contrary to the common view, it was not until the production of the California in 2005 that VW actually produced a camper van themselves – all previous campers were conversions carried out by other companies. It was in Wolfsburg, a town in northern Germany, that the Volkwagen plant was supported to produce the Beetle as a means of stimulating post-war reconstruction. In 1947, when production of the Beetle was rapidly expanding, a Dutch car dealer and importer called Ben Pon, famously sketched out a simple, box-shaped delivery vehicle that was based on the Beetle’s chassis. He persuaded Heinrich Nordhoff, who ran the VW factory in Wolfsburg, to put the van into production. It was an innovative design that maximising the load-carrying capacity of the vehicle, in between the cab over the front wheels and the engine mounted over the rear wheels. The first VW Transporter was unveiled at the Geneva Motor Show in November 1949 and soon became popular as a low-cost, adaptable and flexible utility vehicle. The ‘shoe box’ advert below shows its versatility. The basic Panel Van was simply a load-carrier with no windows. 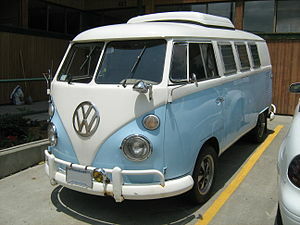 Put in some removable bench seats and windows and you then had the Kombi (the Kombinationskraftswagen). Add some creature comforts such as sliding canvas roof, skylights and high level trim and you had the Microbus or the Deluxe Microbus (also called the Samba). Remove the rear end and you had the flatbed van. Over the years, many variants were produced, both by VW, conversion companies and enthusiasts. While the Beetle was officially named the T1, the Transporter became the T2. Somewhat confusingly, however, the first version of the van became the ‘Type 2 T1’ – or the T1 for short – with the same nomenclature applying right up to the T5, the current version produced from 2004/05 onwards. The T1 became known as the Splitscreen (or Splittie) owing to its distinctive front end or in Germany, the Bulli. Its personality soon developed and grew. The T1 was produced for 17 years betweeen 1950 and 1967. During that time, VW evolved and varied the design, positioning it (like the Beetle) as a “people’s wagon”: affordable, adaptable and with a simple design. Soon, it became in icon of classic, 20th century design, with its cheeky ‘face’ and personality widely adored. With its rear-mounted, air-cooled, 25 horsepower engine it wasn’t exactly powerful, but was fairly reliable and simple enough to fix if anything went wrong. In 1951 VW licensed another German firm, Westfalia, to produce the camper version using the Transporter base and it was exported from 1955 onwards. Westfalia’s camper vans evolved quickly in the early 1950s. They started to produce removable camping fittings that people could install in their Transporters for the weekend, reverting to a work van for midweek. In 1952 they begain producing Camping Boxes, vans with a permantly-installed kitchen unit behind the front bench seat and with a rear bench seat that converted into a sleeping platform. A number of models catered for a variety of tastes, with different sized beds, solid wood or fomica work tops, and folding or concertina roofs. One of the plushest models, the SO23 Campingwagen Deluxe, designed for export to the USA, had curtains, carpets, insulation, additional cupboards and a 90-litre water tank. The only facility the SO23 didn’t have was an internal kitchen since export laws forbade the use of gas cookers within vehicles. In the late ’50s and ’60s Westfalia also sold a distinctive stripy awning as an optional extra which provided shade on the side of the van and either one or two awning sides. While Westfalia were the ‘official’ VW converter of camper vans, over the years many competitors entered the emerging market. In the UK, Canterbury Pitt Conversions and Devon were the first companies producing camper conversions in 1956 and 1957 respectively. 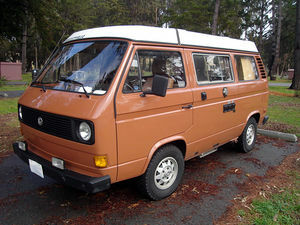 In the US ASI/Riviera and Sun-Dial converted vans similar to Westfalia’s design. This great video shows some early vans including a 1950s camper with all mod cons. This German film provides some amusing early footage of a 1950s Splitscreen Kombi (up to 1 min 30) before reviewing the later T2 T3 and T4 models up to 2004. A promotional video for a VW restoration garage in London rather than a VW promo, this stands out as the coolest film of T1 vans you will ever want to see. Feast your eyes on two 1952 and 1954 barndoor vans and a 1964 panel van. Bringing things to up to date, this UK advert engenders a feeling of the heritage that lies behind VW vans. Celebrating the 60 year anniversary of the first Transporters it shows how you too can buy a commercial van with a long lineage. In Parts 2 and 3 of the series I will review the evolution of the camper van during the ’70s, ’80’s and ’90s right up to the current VW California and ‘Bulli’ concept car. So yesterday saw the launch of Scottish National Trail, running from Kirk Yetholm in the Borders to Cape Wrath in the far north. At 470 miles this will be the longest trail in Scotland and the second longest in the UK (tipped by the South West Coast Path at 630 miles). It’s great to see this first National Trail being launched, created by well known writer and broadcaster Cameron McNeish. 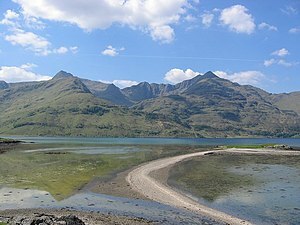 It takes in parts of the existing trails – the Southern Upland Way, St Cuthbert’s Way, the West Highland Way, Rob Roy Way and the Cape Wrath Trail – as well as following the Forth and Clyde and Union Canals between Edinburgh and Glasgow. For serious walkers it’s expected the Trail could take 4 – 6 weeks to complete, although I suspect that most people will be content to bite off smaller chunks. I attended a talk by Cameron McNeish and Richard Else this week where they provided much more background to how the National Trail came about, its route and character. It’s clear that it will showcase the great variety of landscape that exists within a relatively small country, from the rolling borderlands through the former industrialised Central Belt and up through the Central Highlands to the much less populated far north. It’s not a trail that is well signposted – at least, only those parts that follow existing paths and byways. For the most part, the recently-published book indicates the route using key settlements and other milestones but it’s for the walker to consult detailed maps to find the precise route. And for some sections, such as the Cape Wrath Trail (actually, not a signposted trail at all), there’s some discretion as to the exact paths and tracks you wish to follow. But no matter, for whichever path you take between Kirk Yetholm and Cape Wrath, you can still say you have walked Scotland’s National Trail. I did a bit of research to try to discover if there was a definitive listing of Scotland’s most popular munros. I found lots of discussion threads where people have suggested their favourite munros but the nearest I got to a definitive listing is Walk Highland’s list of most climbed munros, based on submitted trip reports (312,000 at the time of writing). What do we notice about this list ? Well, they’re all southerly munros with the exceptions of Ben Nevis and Cairngorm. Secondly, the list reflects the popular hills close to population centres. In other words, they’re the most climbed because they’re the most convenient and accessible to most people. This clearly isn’t a definitive list – it depends so much on a wide range of factors (weather, time of year, who walked with you etc) and I may feel differently tomorrow – but it’s a pretty good stab I think. What do you think ? Any surprises ?